The Phillies are in a unique position this trade deadline. Young talent they’re leaning on, like Maikel Franco and Vince Velasquez, haven’t supported them. Veterans they brought in to stabilize the roster and perhaps become trade chips for this very moment have faltered, too, leaving them to fall without grace to baseball’s basement. And then there’s Pat Neshek, journeyman side-armer. He offers one of the brightest glimmers of hope they have. Not only do they need to trade him – he was recently ranked the 3rd most valuable trade chip by MLB Trade Rumors – but it can’t be for whatever they can get simply because he’s set to be a free agent. Shutdown relievers matter too much as the season goes on to get anything less than a top 50 prospect. 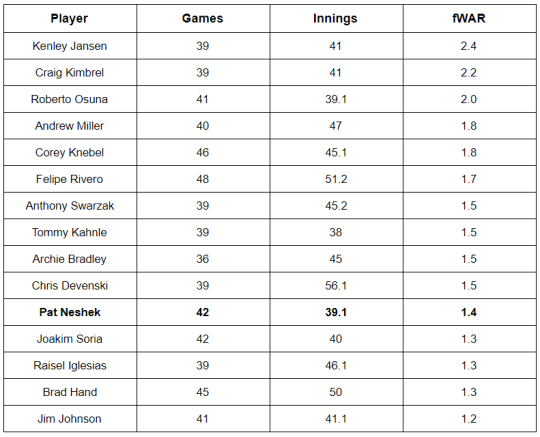 Neshek has been one of the best in the game this year by fWAR. And look at all the guys ahead of him – the only one likely to be moved already has been, with Tommy Kahnle going from Chicago to New York. (Kahnle’s old teammate, Anthony Swarzak, hasn’t been mentioned much in rumors to this point.) And what did Kahnle help fetch for the White Sox? Blake Rutherford, the fourth-best Yankees prospect and 49th-best in baseball, according to Baseball Prospectus. It’s not just about Kahnle, who was a part of a larger deal, though. Look at last year. Cleveland traded Clint Frazier to the Yankees for Andrew Miller. At the time, BP felt Frazier was the 26th best prospect in baseball. He’s already making an impact in the Yankee outfield. A week before moving Miller, the Yankees traded Aroldis Chapman to the Cubs for Gleyber Torres. Torres was ranked by BP as the 36th best prospect in baseball. The Chapman trade is particularly relevant to Neshek’s case because Chapman, too, was slated for free agency after the season. Neshek does not have the track record of either pitcher in these deals or the control of Miller, but it’s not necessarily about those things right now. It’s about “what have you done for me lately?” And Neshek has locked down the opposition this year about as well as one could want. The Yankees didn’t just catch desperate clubs in these deals, either, even though that argument could probably be made and supported in favor of the Phillies’ trade landscape. They also showed that they’d buy at a price similar to what they sold for when they acquired Kahnle and company. 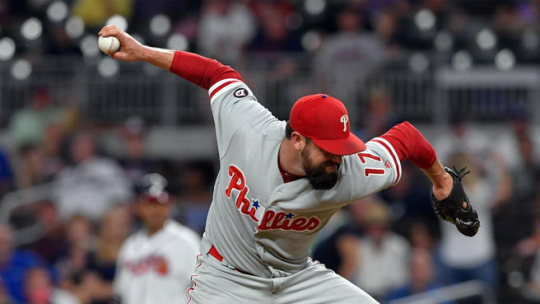 The question now for the Phillies is who might be looking to boost their World Series hopes with a relief ace like Neshek? Five Thirty Eight’s Neil Paine just published the site’s trade deadline guide, using what he and Nate Silver created and call the Doyle Number. It ranks all teams and categorizes them into Solid Buyers, Cautious Buyers, and Sellers. A score of 1 means the team might want to hold; higher means they should consider buying and lower means they should probably be selling. Focusing on the Solid Buyers gives the Phillies five potential suitors for Neshek: the Dodgers, Astros, Nationals, Red Sox, and Indians. Every other team has at least one reason to hold back on making a move for Neshek despite his dominance in 2017, be it the context in which they currently sit or their general nature. 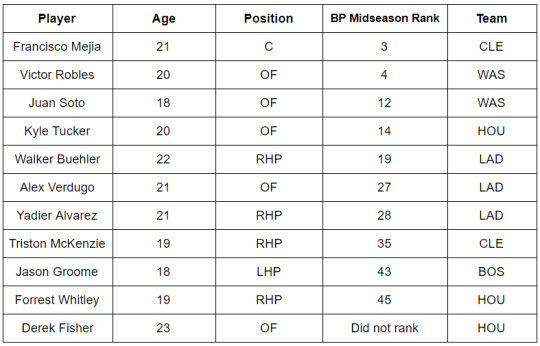 Combined, these teams have 11 prospects in BP’s Midseason Top 50. Now, remember, the highest ranked prospect in any of the trades mentioned above was Clint Frazier, at 26. That means we can probably cut half the list, unless Washington gets really desperate to continue improving their bullpen. The Dodgers front office might be considered too smart to deal a long-term asset for a short-term acquisition, but maybe not. Their system is stacked beyond the players on this list and postseason success has been elusive for them. They might mimic the Cubs of this year, in that they’re a dominant force looking for a topper to round out the roster. Maybe Cleveland lets the sting of last year’s 3-1 lead over the Cubs in the World Series and failure to seal the deal get under their skin, and they pull the trigger on another deal for a relief ace. Boston might not want to give up on the pitcher they drafted at 12th overall just a year ago, but they could be compelled by the Yankees having just pulled the rug from under them in their trade with the White Sox. And then there’s Houston, who is pacing the Dodgers in the AL. And, like LA, they have a stacked system that could afford the risk of dealing for an older, uncontrolled asset like Neshek. Derek Fisher didn’t place on BP’s midseason list but he’s still a top prospect. He hasn’t worked his way into the Astros lineup despite mashing in AAA and could make sense for both teams. These might not be the only options the Phillies have, but they might also be the best ones, based on consensus and recent history. A top young talent from the outside could provide the next step forward that their in-house players haven’t been able to provide this year. Even if they have to add to Neshek, they have to find a way to get a deal done. Settling for anything less than a top 50 prospect would be another underwhelming moment in season that’s had far too many. Neshek photo above from CSN Philly.